HARRISBURG, Pa., Dec. 4, 2017 /PRNewswire/ -- The Capital BlueCross lobby was filled today with nearly 600 gifts heading to children around Central Pennsylvania for the holidays. The company's annual "Secret Santa" program provides gifts to children, from infants to teenagers, who otherwise may not have a gift to call their own this holiday season. The Capital BlueCross tradition has been helping families in need for 29-years. Since 1988, nearly 35,000 children have benefited from the generosity of company employees. The voluntary program allows them to choose a gift tag with a child's first name, age and wish list. They purchase gifts or donate into a pool of money that volunteers use to do the shopping. "Capital BlueCross employees look forward to this tradition each year, with many of them choosing the names of multiple children to provide gifts for over the holidays," said Gary D. St. Hilaire, president and CEO of Capital BlueCross. 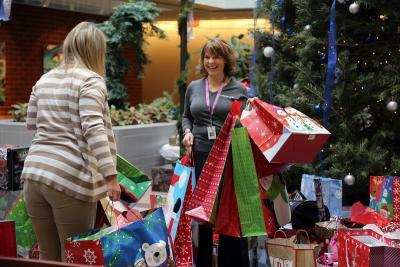 "Our Secret Santa program brings our employees together in the spirit of giving each year. As a community-based health insurer, it is part of our commitment to making a difference in Central Pennsylvania and the Lehigh Valley." Secret Santa helps children in Cumberland, Dauphin, Lancaster, Perry and York counties. Capital BlueCross employees put the items in gift bags and pack them to be delivered to the children. "We are so grateful for the generosity of Capital BlueCross and its employees. Each year, they help us fulfill the holiday wishes of 200 local children," said Kathy Anderson-Martin, The Salvation Army Harrisburg Capital City Region. "But it doesn't end at Christmas, as they volunteer and support our programs benefitting young people in our community throughout the year." Kids Peace: Gifts will be provided through the Kids Peace Angel Tree Program which serves the behavioral and mental health needs of children, families and communities. In addition to its Secret Santa program, Capital BlueCross embraces the spirit of corporate and community giving throughout the year, supporting numerous charities and community organizations in Central Pennsylvania and the Lehigh Valley.